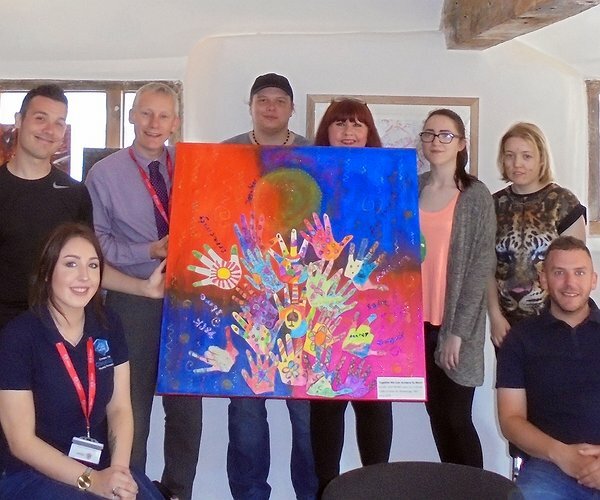 The residents, from the Quay Project in Greenfield, and Greenbank Villas in Flint have taken part in art workshops organised by the ODEL Involve advice and support team based at the Old Court House Café and Community Heritage Hub in Flint. “The sessions provided an opportunity for residents to reatively explore a wide range of issues at the same time as gaining confidence and self-esteem as they work developing or building on their art skills,” added Louise who thanked Senior Project Officers Carol Hughes and Kerry Roberts, along with Jo Lloyd, for supporting the initiative. Paul Seymour, Corporate Director Resident Services for the Pennaf Housing Group, which includes Clwyd Alyn recently successfully bid for the finished artwork in a charity auction so that it can brighten up his office. “There’s a lot of energy in the piece as well as some really thought-provoking ideas that come through. It’s particularly apt that I was presented with the finished work this week, in National Mental Health Week, as the art sessions provided a really supportive, therapeutic way for the residents to explore many of life’s issues.